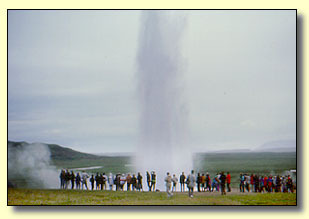 There is only one Icelandic word used in the English language: geyser. Though the word refers to all geysers in general, it comes from a single geyser (in fact, the geyser) located in the South West of Iceland. Unfortunately, the Great Geysir has been somewhat shy in recent decades, though on special occasions it can sometimes be coaxed into a performance with some soap. When Geysir does perform, it lives up to its name, spuming a jet of steaming water 200 feet skyward. Far more reliable, though less spectacular, is nearby Strokkur (the churn), which spouts a 60-100 foot jet about once every five minutes. The geyser area is also rich in walking paths that lead past steaming vents and colorful, mineral-rich mud formations.